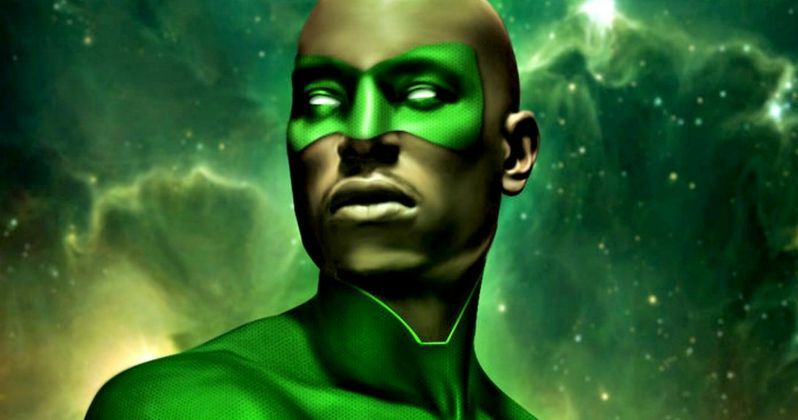 Green Lantern Corps Closer to Getting Tyrese as John Stewart? When Warner Bros. announced their massive lineup of DC Comics movies back in October, the last project on that list was a Green Lantern reboot, which is now entitled Green Lantern Corps. Very little is known about the project thus far, but actor Tyrese Gibson has been actively campaigning to play John Stewart, one of the many characters who serves as the iconic superhero in the comics. During a new interview with Collider, the actor confirmed that he actually has met with Warner Bros. for a role in Green Lantern Corps., stating that he feels there should be more black superheroes. "I've already had a couple of meetings at Warner Bros., so we'll see what happens. I do believe that there needs to be more black superheroes out there, but that's not even my motivation. I think I would be the best Green Lantern and based on my fans and supporters that spent around $6 billion in box office receipts, I feel like there's a fanbase of fans out there waiting to see me put on this green suit and do my thing. So I would love to confirm something today but I can't. We'll just keep following up." The actor's campaign actually started when he noticed pieces of fan artwork depicting him as John Stewart. The fan who created the artwork said there was a "community" of fans who thought he would make the best Green Lantern. From that point on, the actor was committed to this potential role. Here's what he had to say about the fan's support for this role. "Well I was innocent from the beginning. I was at home eating a bowl of Lucky Charms in my drawers, my ugly feet were out, and I got about six direct messages on Instagram with photos of me as the Green Lantern. This particular fan who did this fan art said that there was a community of people that had been talking for like a month and a half about who they think would be the best Green Lantern and they all picked me. I said to them, 'I took the oath, and I am going to commit myself to this process of seeing what's possible.'" Last month, a rumor surfaced that Green Lantern Corps. will feature both Hal Jordan and John Stewart, with Chris Pine reportedly attached to play Hal Jordan and Tyrese Gibson playing John Stewart. Some believed that Warner Bros. was going to announce the casting at Comic-Con earlier this month, but that never happened. Do you think Tyrese Gibson is the perfect choice for John Stewart?